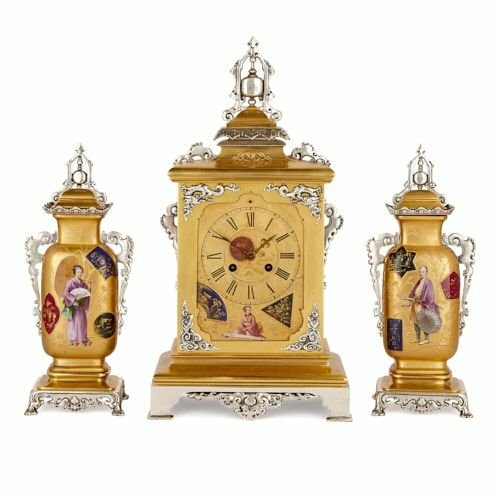 Crafted in the fashionable France ‘Japonisime’ style of the 19th Century, this clock set features fine porcelain Japanese figures in traditional costume. 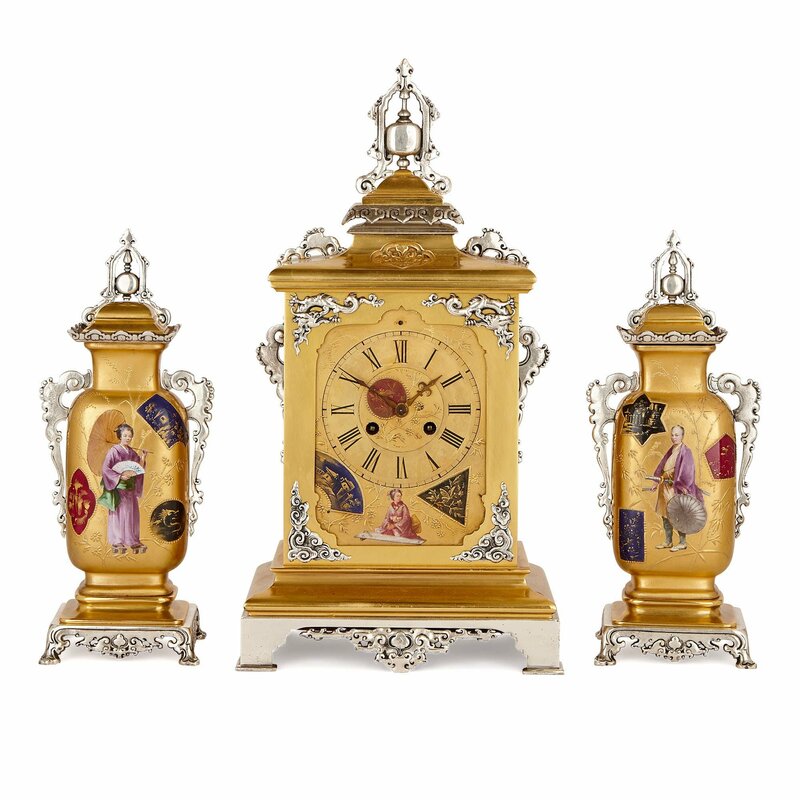 This set consists of a Japonisme central clock, flanked by two vases of a similar design. 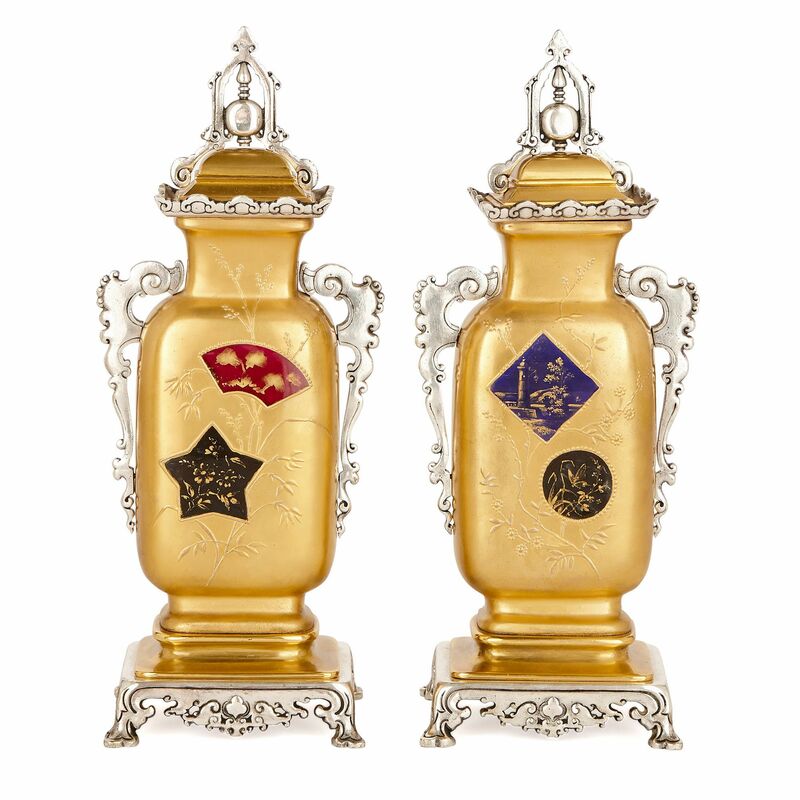 The pieces have been crafted from gilt brass, and feature silvered brass mounts and porcelain decoration. 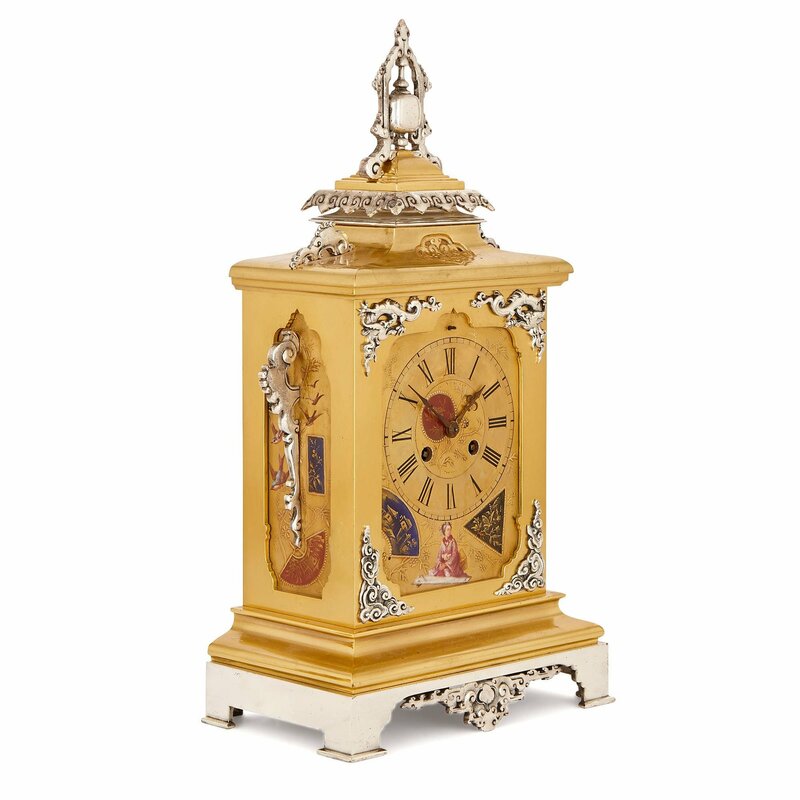 The rectangular, gilt brass clock case is raised up on a silvered brass base, which features a shaped, scrolled apron, and which rests upon four bracket feet. On the front of the clock body, there is a recessed, shaped rectangular panel, with a circular clock dial at its centre. 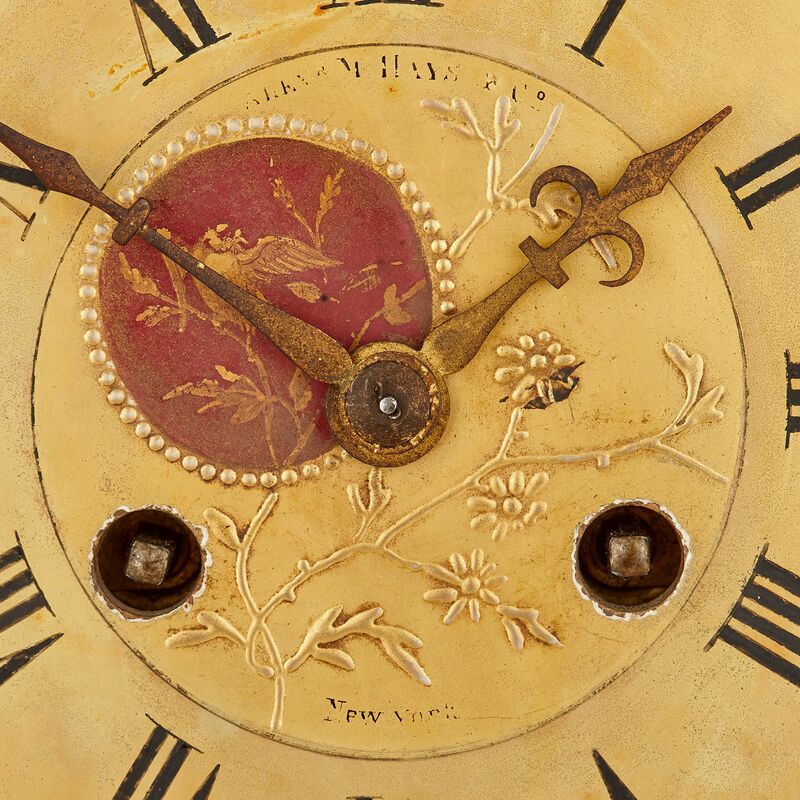 The dial features Roman Numerals, and it is decorated with an embossed flower and red porcelain medallion, which has been painted with an image of a bird. The dial signed with the retailer’s name, ‘ALEX'R M HAYS, NEW YORK’. In the lower section of the recessed panel, there is a porcelain depiction of a woman in a pink kimono, sitting before a koto (a traditional Japanese stringed musical instrument). Embossed flowers and porcelain geometric shapes accompany the woman. These include a navy fan, which is painted with buildings, and a black triangle, decorated with floral ornament. Silvered brass dragons are mounted onto the top corners of the front facade of the clock case, and swirling, cloud-like silvered brass forms ornament the lower corners. 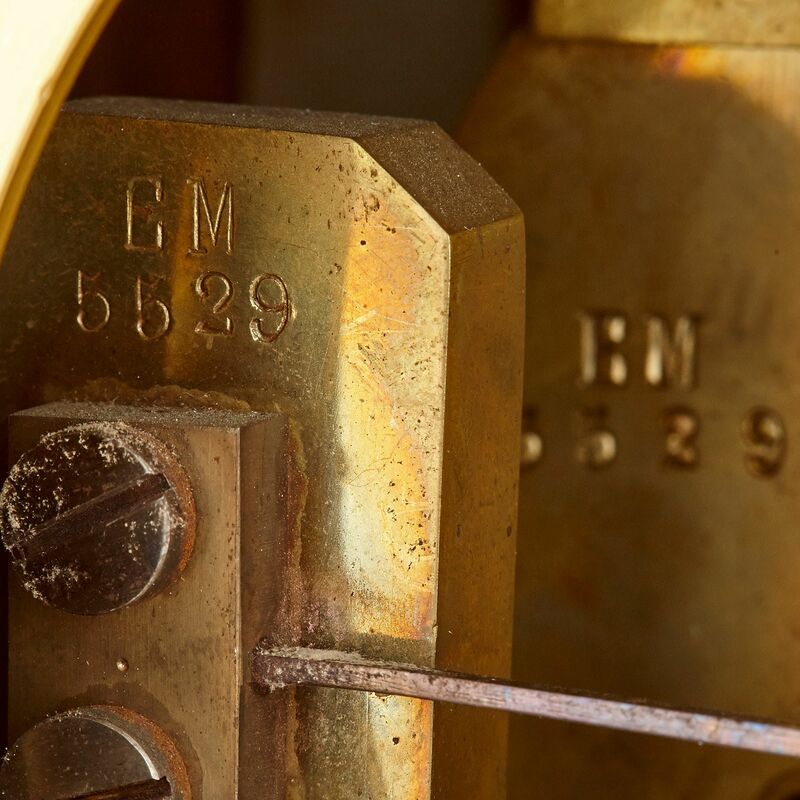 The sides of the clock feature scrolled silvered brass handles, set into recessed panels. These panels are decorated with porcelain swallows, embossed flowers, and red and navy, ornamental geometric shapes. 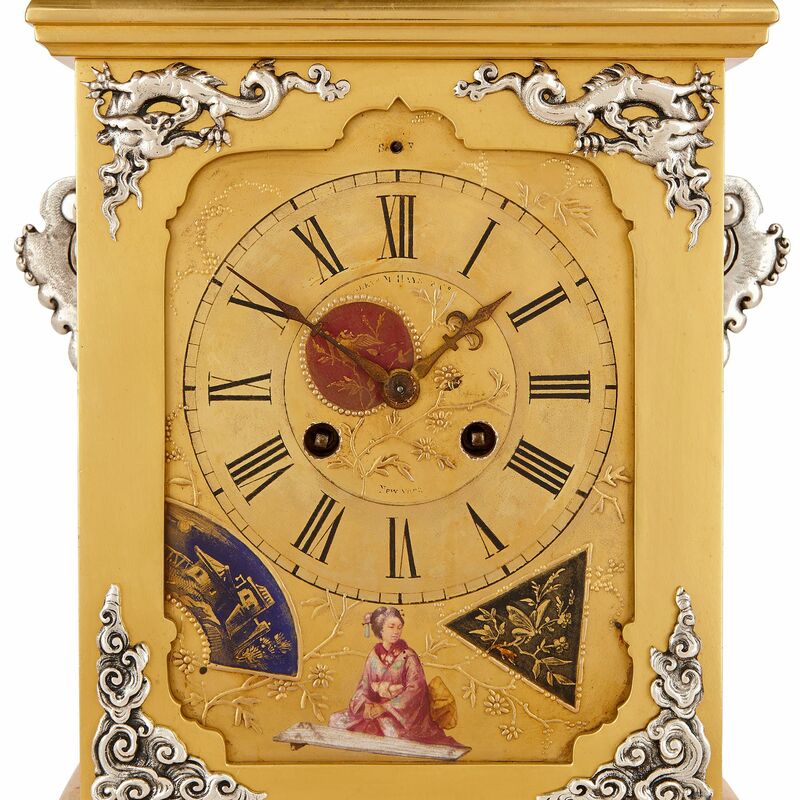 Surmounting the clock case is a gilt brass, Japanese style pavilion roof, which is decorated with a cusped silvered brass edge. The piece is topped by a pointed, silvered brass finial, with a scrolling frame and medallion centre. The vases that flank the central clock are similarly designed. However, they differ from the clock, and from each other, in their porcelain decoration. One vase case features the porcelain figure of a young Japanese woman, wearing a purple kimono and wooden geta shoes, and carrying a wagasa (oil-paper parasol) in her left hand, and a painted white fan in her right. She is surrounded by red, navy and black porcelain geometric shapes, which are decorated with cloudscapes, traditional buildings and dragons. A porcelain Japanese man ornaments the second vase. He wears a purple haori jacket, a yellow kosode, grey-blue trousers, socks and sandals. The man holds a knife in his right hand, and he has a katana sword tucked into his belt. In his left hand, he holds a circular metal shield. Like the woman, the man is surrounded by three geometric, red, black and navy shapes, decorated with painted flowers and architectural scenes. 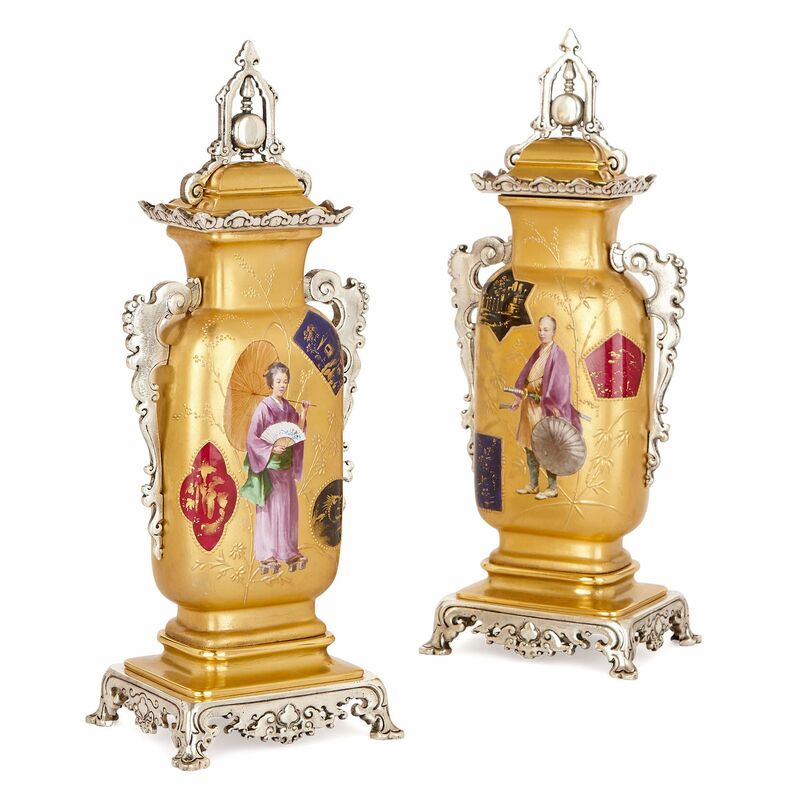 Each vase back is decorated with a relief flower, and with two painted porcelain forms.